We have some useful tips for you about metal roofing installation. If you have any problems with roofing installation, or need help with the technical aspects of laying your metal roofing, ask us for any advice you need. We’ll be happy to provide any assistance you need. Pierce-fixing uses fasteners to attach the sheet to the roof frame. Screws should be fixed perpendicular to the sheeting or cladding in the middle of the rib, and always at the top of the crest for maximum water tightness. Screws can be fixed through the pan/ valley or crest for walling applications. Concealed fixing uses fasteners and clips and this method means that the screws will be hidden underneath the exterior of the roof sheets. Clips are affixed using double sided facings and at regular intervals along the sheeting according to site requirements. Please note that these two types of fixing are used for different types of metal roofing. If you’re not sure which is best for your type of roofing, ask us. Overhangs of metal roofing should conform with design specifications whilst also overhanging at an even length into guttering. DO NOT lay further sheets if any sheeting is uneven or crooked (This will save you a lot of remedial work, which can be very hard work indeed). For best weatherproofing, begin installing your sheeting on the side opposite the prevailing wind. Position your sheets on the ground before raising to the roof for laying. Sheets should be checked to ensure that the top side faces upwards. The overlapping sheet edges should be raised facing the direction of installation, i.e., positioned the same way as the other sheets. DO NOT place sheeting in a position where it isn’t fully supported, to avoid bending. Make absolutely sure the first sheet laid is properly positioned. Both ends are properly positioned in accordance with the roof plan. 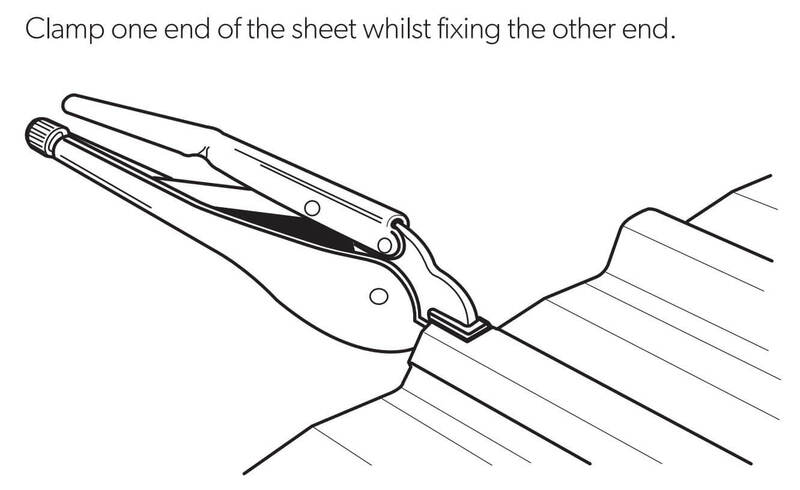 Proceed to the next sheet only when you’re sure your sheeting is 100% accurately laid. A measurement from the end of the sheet to the fascia or purlin at the gutter. Fix the sheet sufficiently to ensure it can’t move, complete laying all sheets, then return to place all the intermediate fasteners later. Be sure to keep an eye on each metal roofing sheet to ensure they are properly aligned in relation to the first sheet. Take two measurements across the wide face of the sheeting and compare. They should be the same. Properly align and fix the sheet. Fix the opposite edge of the sheeting, with fasteners or clips nearer or farther from the position they would be on the correct alignment. Progressively fix alignment so sheets are brought back in to the proper position. To avoid moisture entering laps by water action, metal sheets are slightly modified to manage this problem. All profiles are designed for only one rib to be overlapped to ensure the water tightness. Sheets must be properly affixed according to the type of sheeting you’re using. Place the first sheet and following sheets with their side-lap fitting closely over the sheet laid before it. Ensure that sheets are fitting well at each stage of laying until the final end of the sheet has been laid. The upper end of the sheet: should meet the side-lap very closely; check positioning, and fasten the sheet when you’re happy with its position. Crest fixing may also be used on the above products when these are used for walling applications, however valley fixing is more common for walling. Although when valley fixing you will always require a side-lap fastener in all laps at each support. It works out to be more economical to with labour, time and with the cost of fasteners to use a crest fastener at each side-lap in place of the lap fastener and adjacent valley fastener.